Pumpkin is such a wonderful ingredient to work with in recipes. The mild but distinct flavor makes it a fall favorite, since fall is traditionally pumpkin harvesting season! Pumpkin is also an easy ingredient to purchase, being available all year in canned varieties. My personal favorite of canned pumpkin is Libby's. Libby's pumpkin is made from pumpkins in Illinois, a specific type of pumpkin, and has a slightly sweet yet pumpkiny goodness that I love. It is also very consistent can to can, which I have found not to be true in other brands. I am writing this in a separate paragraph for a reason: DO NOT confuse CANNED PUMPKIN PIE MIX with canned pumpkin. The pie mix is much more runny and has various spices and more sugar than what you might want in your recipe. Pumpkin pie puree is fairly easy to make yourself if you are willing to spend a bit of time. I learned how from the Pioneer Woman YEARS ago. It is fairly easy and it is so delicious. Use pie pumpkins. That's what they are for. However you choose to get your puree, try some of these recipes to satisfy your pumpkin urges this fall. You will be glad you did. Oh my all of these recipes sound amazing. I must try the pumpkin biscottis they are my weakness. These all look so fabulous! I'm in such a pumpkin mood. I keep hashtagging #PumpkinEverything, because well....Pumpkin Everything! Fall Rules! Can't wait to try the enchiladas! There isn't much Fall here in Florida but we still manage to eat our fair share of pumpkin treats! I buy pumpkin year round. I love using it as a healthy way to add moisture. It's full of fiber and flavor. It's a staple for me! I'm not going to lie. I love everything pumpkin and apple flavor. All of these look delicious and recipesI need to try! Pumpkin scones are the BEST. SO good!!! I love them! I make them every season (probably way too early) but I love them that much. I love pumpkin and I'm always on the lookout for yummy pumpkin recipes. I can't wait to try all these. Where is the drooly emoji? I need it here!! These all look amazing and I can't wait to try a few out on the family! Oh yeagh, I love this post. My eldest is pumpkin nuts and will try anything pumpkin related. I love sweet pumpkin treats, but my favorite way to eat pumpkin now is a coconut curry pumpkin soup I make served over rice - so good. You can never enjoy fall without pumpkin and I think it's awesome that you're sharing all of these ideas with us. You can never have too many pumpkin recipes, right? Ahhhhh ''tis the season of all things pumpkin!!!! So many yummy recipes here. I will have to give a few of these a try! And now I want pumpkin stuff even more than I already did...time to get cooking!!! I want to try the coconut pumpkin granola. Sounds like a perfect pair to a warm glass of milk in the morning. I just bookmarked this page as I love the options. I often make Pumpkin Sabzi (Indian Style) and it's on my list tomorrow. Perfect post for the upcoming season. Yum! I can't wait to try some of these! They sound delicious. I love the food at this time of year. Pumpkin is definitely one of my favorites! I am so happy to see so many options. I love everything pumpkin but I must say that pumpkin pie with loads of whipped cream is THE best. 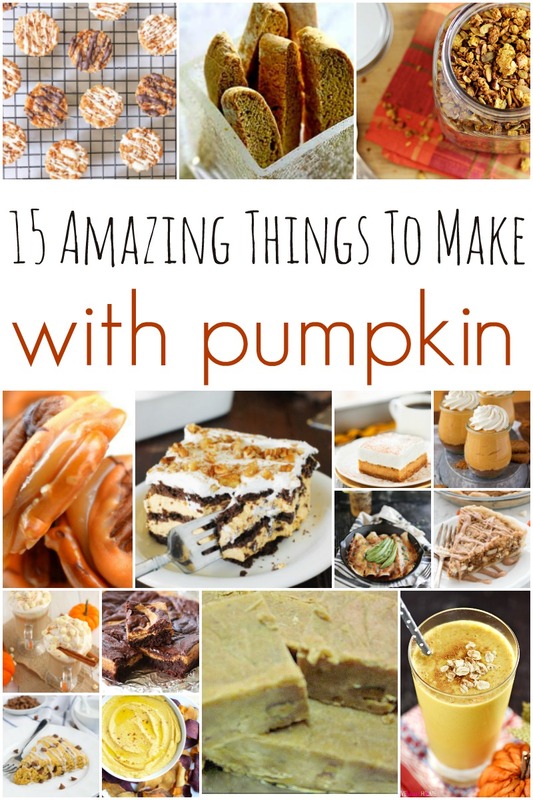 Oh man this makes me want to make all kinds of pumpkin things and with this list, I can make something every day!!! These are so perfect for fall! This time of year, everyone gets crazy for pumpkin! That pumpkin humuus sounds pretty interesting! Thank you so much for this resource! Just the other day I bought 4 cans of pumpkin puree just because I knew I was going to be making something with pumpkin someday soon!